The munsell package provides easy access to, and manipulation of, the Munsell colours. The munsell package provides a mapping between Munsell’s original notation (e.g. “5R 5/10”) and hexadecimal sRGB strings suitable for use directly in R graphics. The package also provides utilities to explore slices through the Munsell colour tree, to transform Munsell colours and display colour palettes. Munsell devised his system of colour notation to match the three perceptual dimensions of colour: hue, value and chroma. His notation provides a naming scheme to colours that eases the choice of color according to a specific purpose. His century old advice is still relevant for the producers of statistical graphics and the munsell package aims to enable user to easily follow it. 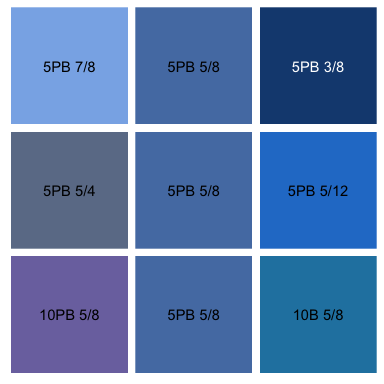 Functions in munsell fall into three basic use categories: specifying Munsell colours, altering Munsell colours and exploring the Munsell color space. munsell provides convenience functions that alter a colour by taking steps in the hue, value and chroma dimensions: rygbp, pbgyr, lighter, darker, saturate and desaturate. Each function optionally takes the number of steps to take in the dimension and consequently are easily used to create scales in a particular dimension. 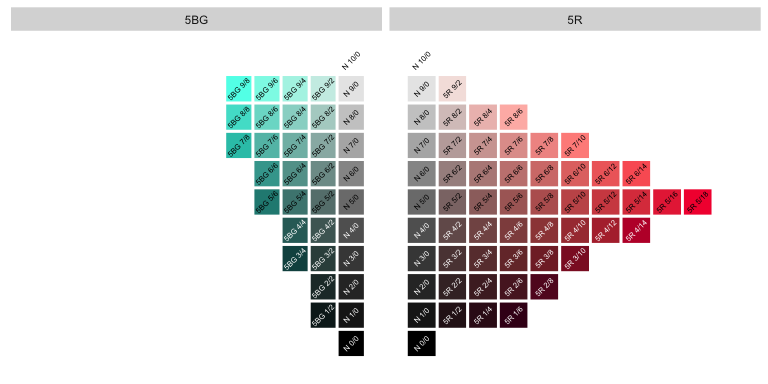 Slices through the colour space of constant hue, chroma or value can be displayed using the functions: hue_slice, chroma_slice and value_slice. Additionally complement_slice displays a slice of constant hue, alongside a slice of its complement, the hue that is on the opposite side of the colour sphere to that specified.